It takes some time to get used to it ..but once you figure out how to use it you will love it. Texting (SMS messages) is what I really like specially sending it by my computer not android phone. And it keeps records in cloud so you won’t lose it. They have good support over chatting or via email. I use DialPad for my business and will never leave? WHY? I was a DialPad user and switched to a different company to save a little money, but that was a horrible mistake. It lasted less than a week. I experienced so many issues with the companies technology. Fortunately DialPad helped me to get back on board and port my number back. The customer service is top notch! The quality is great either on my computer or via the app on my phone. I use DialPad for my business and will never leave? WHY? I was a DialPad user and switched to a different company to save a little money, but that was a horrible mistake. It lasted less than a week. I experienced so many issues with the companies technology. Fortunately DialPad helped me to get back on board and port my number back. The customer service is top notch! The quality is great either on my computer or via the app on my phone. 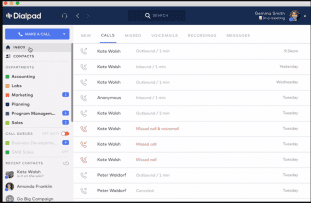 Dialpad is an excellent internet-based phone service that allows its users to contact any employee without the need of a directory, or saving multiple numbers to a work phone. The app can be used to make calls as well; it even has features like call holding, transfer, or transfer to voicemail. Anyone using the app can just look up the name of the employee they wish to call. The only downside, in my opinion, is how much the service relies on the internet for its services. If you have no signal, it becomes impossible to search for people to call or transfer. If you’re on an HD Dialpad call and enter a dead zone, your call will be dropped. While these cons are frustrating, it is important to note that Dialpad does have an option to accept or make calls using the carrier services as well. In all, Dialpad is a reliable service for businesses that have a reliable service/internet connection and can make communication much easier than before. Pros: Contact anyone in your company using dialpad without relying on a directory. Cons: Needs reliable high speed internet to use some features. Sales; we make and receive calls and presentations anywhere, on any device. Logging calls and transcriptions in our CRM is a breeze. Customer Success; inbound calls are logged in our Zendesk for better customer response. Uberconference is a great tool for Customer onboarding and collaboration. Pros: Easy to manage, use, and onboard employees. We have been using Dialpad for over a year now. As their services and features have grown we keep finding the platform more useful than ever. 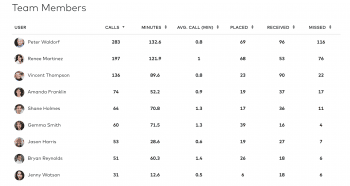 I really recommend to all businesses that have a call center or a sales staff where monitoring activity is key. As one of the leading pure-cloud communications solutions for business, Dialapad offers HD voice, video group messaging, SMS, MMS, conferencing and even screen sharing in their packed Unified Communications platform. Ideal for businesses big or small, Dialpad modernizes the business phone system by moving it to the cloud. It keeps teams connected and productive by putting voice, messaging, meetings, and video on any device. Groundbreaking VoiceAI technology unlocks conversation insights and automates time-wasting housekeeping tasks. Plus integrations with G Suite, Office 365, Zendesk, and Salesforce make deployment a cinch and keep everyone in your org productive. Dialpad doesn’t require any additional hardware, infrastructure, or IT support. It can be deployed across an entire organization in minutes, and can be scaled with just a few clicks. You’d be hard-pressed to find a better pedigree than founders Craig Walker, John Rector, and Brian Peterson. Dialpad offers a price point that is one of the lowest you can find, especially for unlimited calling. They don’t cut corners by being stingy with features or nickel-and-diming you with hidden charges – they just offer a great product at a low price. As a pure-cloud provider, Dialpad offers completely hosted solutions tailored to both the SMB and Enterprise market. With more than just simple, and unlimited, VoIP calling Dialpad offers an entire hosted UC stack. If your company is looking to adopt a cloud only solution, Dialpad is very high on the list of options to consider. Beyond simple VoIP calling, Dialpad also offers an entire Unified Communications stack of products, so your team can stay in touch with a variety of channels. Dialpad also provides HD video calls and conferencing, which can of course integrate with the business apps you user everyday. Dialpad also includes instant messaging, direct SMS, MMS, and group messaging integrated directly into the Dialpad solution for a truly multichannel Unified Communications offering. Businesses can utilize these channels for in office messaging, or even offer new methods of communications to clients or customers. Dialpad’s mobile app also allows users to stay connected all at once, and receive a single message on up to 5 devices at the same time. Dialpad also boasts a very strong integration base to build off of. Of course, with the nature of APIs a seasoned developer could build almost any integration for any platform. However, with Dialpad, you are adopting a solution that already has prebuilt integrations for some of the most popular solutions. Whether your business utilizes Google Apps for work, or is invested in the Microsoft Office ecosystem, Dialpad has you covered. The UC solution comes with both Google Apps and Microsoft Office integrations baked right in, so you don’t have to sacrifice a developer’s time just to build the bridges. 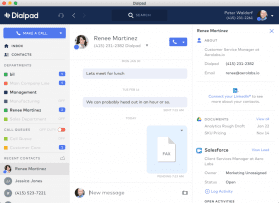 On top of office apps, Dialpad also supports a unique integration with Salesforce, to bridge the gap between CRM and UC for a true omni-channel support experience. On top of everything else included in Dialpad’s solution, users also gain access to the incredibly popular and renowned UberConference. As a dedicated conferencing solution, Uberconference allows users to host group phone or video calls without the need for a PIN. Uberconference attempts to make conference calls as simple as possible, and has even won multiple awards including the 2014 Telecommunications Company of the Year – Silver, the 2014 Best Everyday Utility User Experience Award, and the TechCrunch Disrupt Annual Winner 3 times in a row – just to name a few. What Do You Think of Dialpad?